FANBOY PLANET.com . : mc-cirquetotem :. Shakespeare wrote that actors "…hold a mirror up to nature." 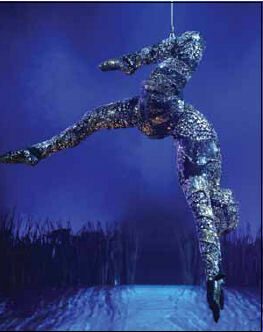 Maybe he didn't mean it quite as literally as it comes through in Cirque du Soleil's latest endeavor, Totem, but it's hard not to think of those words as a Crystal Man (Joseph David Putignano) lowers from the top of the tent signaling a dazzling journey through man's relationship to creation itself. Or perhaps as another poet, Joni Mitchell, put it: we are stardust. That motif wends its way through Totem as it goes from the amphibian beginnings of life on Earth (on the back of a tortoise -- creation myth reference #1) to a dazzling walk through space. In the middle, modern businessmen strip off their suit coats to reveal red and black shirts with starry highlights that could represent torn flesh, skeletal structure or a whirlpool drawing us into the infinite. At any rate, show creator Robert Lepage clearly wants us to see how interconnected we all are with creation – even as many seem ignorant of it. After the frogs cavort in a marshy carapace, out comes an all-too human clown (Pippo Crotti) and a day at the beach with muscular surfer types competing for the attention of a statuesque flying rings artist (Alevtena Titarenko), who actually has the most developed physique of them all. Crotti appears a few times throughout the evening, a caricature of swaggering arrogance and consumption who teams with Mykhalo Usov to remind us that when man tries to dominate nature, nature has a way of winning. It does play the long game, after all. Despite the presence of a 19th century scientist (Greg Kennedy), it may be that we can only grasp bits of nature's significance. 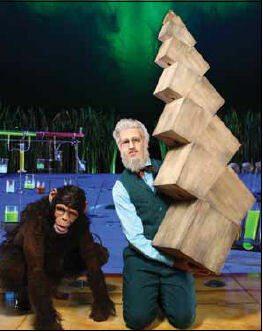 Trying to unlock the secrets of the universe in a series of clever manipulations, Kennedy may youthen and understand his connection to his simian sidekick (Putignano again), but are his answers any more satisfying than the creation myths that weave in and out of this presentation? All throughout we have a red-skinned guide called "The Tracker" (Ante Ursiq). He is there among the frogs, a ringmaster guiding this unconventional circus hurtling through creation. Reminiscent of the devil, and a master of the act known as "The Devil Sticks," the Tracker observes and enjoys those in harmony with nature, but shakes his head at the folly of those who think they are above it. 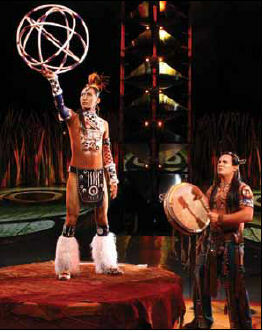 In harmony are Amerindian dancers, who remind us with a hoop act that life is a circle. That image culminates in a roller-skating act on a 1.8 meter drum stage that will absolutely change your feelings about something described as a roller-skating act. It's daring, provocative and meant to be evocative of a Native American wedding ceremony – simply beautiful and powerful. Life is a circle...under a tent..
That stands in contrast to an earlier trapeze act that represents the tentative playfulness of young love, with movements so free of gravity it's hard not to lose track that we're not simply seeing an overhead shot of two people lying on a platform. No – they're suspended in mid-air and have that much control. It all plays to a pulsing live band, scored by a duo known as "Bob & Bill," with music as powerful as the earthy, colorful and sometimes downright alien costumes of Kym Barrett. At the end of the night, all of our senses have been overwhelmed, and the lights come up taking us back down to earth and out onto the pavement. If you're lucky, you'll remember the lesson of Totem while walking out, and take a moment to look up to the stars.